The MDC Alliance will elect new leaders at congress in May - a process which will make or break the country's biggest opposition party. While the nomination process has not yet started, party leader Nelson Chamisa is likely to fight out his position with his deputy Elias Mudzuri and secretary general Douglas Mwonzora. At least 1,000 delegates are expected to be voting at the congress. Pundits have questioned if Mwonzora and Mudzuri have done enough groundwork to upset Chamisa who narrowly lost to President Emmerson Mnangagwa in the July 2018 elections. 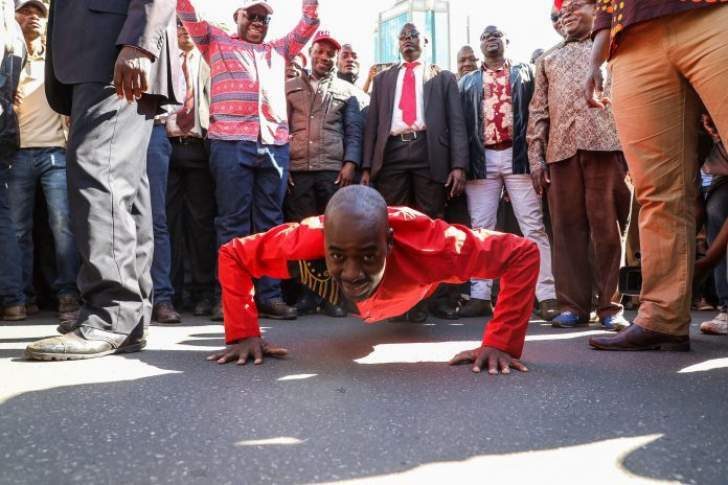 Analysts say the congress is Chamisa's opportunity to clear the legitimacy issues that has surrounded his presidency since he thrust himself on the party after the death of long-time leader, Morgan Tsvangirai last year. "It is a foregone conclusion that Chamisa will win as he has shown a lot of political maturity and has united his party members," said the political analyst, Ibbo Mandaza. "No one has capacity to defeat him as he has proven to be popular with the party." Eldred Masunungure, a political science lecturer at the University of Zimbabwe, agreed with Mandaza saying the political days for Mudzuri and Mwonzora were numbered. Mudzuri holds the record as one of the successful mayors of Harare, who in 2002 launched a massive anti-corruption crusade against councillors and ministers. He has held several positions in the party, among them organising secretary, until he was appointed vice president. He was entangled in a tussle with Chamisa for the party leadership following the death of Tsvangirai. Mudzuri lost the battle to Chamisa after the 41-year old former student leader was endorsed by the National Council. Mwonzora, on the other hand, became popular when he was appointed to represent the party in the constitution-making process which began after the formation of the Government of National Unity in 2009. A lawyer by profession, Mwonzora was party secretary for information and worked with Paul Mangwana (ZANU-PF) and Moses Mzila Ndlovu (MDC) to lead the process that brought the country's first constitution after independence. In 2013, Mwonzora lost his parliamentary seat to Hubert Nyanhongo, a Zanu-PF candidate. Despite the loss, Mwonzora was elected secretary general after beating Chamisa for the post during the party's 2014 elective congress. Mwonzora garnered 2464 votes against Chamisa's 1,756. Chamisa was 21 years old when he joined the MDC in 1999. A year previously, he had been elected president of the Harare Polytechnic Student Representative Council (SRC) in his first year at the institute. He became one of the youngest MPs in 2003 and served as the party's youth leader, organising secretary, secretary for information, vice president, and currently president of the party. Chamisa enjoys grassroots support and has the backing of party heavyweights such as Tendai Biti, Job Sikhala and Welshman Ncube. "The split in the MDC Alliance will not have any impact on the party as Chamisa has managed to mobilise party members behind him who will reward him at the congress," said Ibbo Mandaza. "Chamisa has united all the splinter groups under the MDC Alliance and those who had left the party during Tsvangirai's days are back to the fold, the question is: What is going to happen to Mudzuri and Mwonzora after the congress?"